• Included Accessories: Transmitter, 12V DC charging station, removable Lithium Battery, and heavy duty duffle bag for storage. 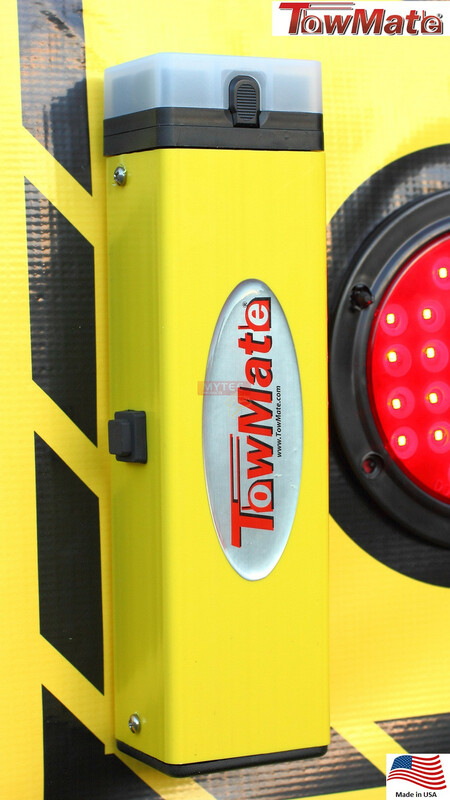 The Wirelessly Lit Oversize Load banner is not only illuminated but also synchronized wirelessly with the vehicle's turn signals, brakes and running lights. Powered by a Lithium Ion power supply, it runs 24+ hours straight. Grommets in each of the four corners ensure that any strap will have a secure place to fasten to. Additionally, each light is riveted to a backing on the rear of the banner to keep them securely fastened. The whole system is easy to roll up and tuck away. The system includes banner w/2x 4"" round LED S/T/T lights, 2x 4"" round LED amber strobes, 3x 2"" center LED marker lights, Lithium battery/Receptacle, 12V DC charging station and transmitter of your choosing (standard is 7-Pin Round).